First off on this super busy week around the farm, El Paso Home Delivery launch. El Paso has been a great supporter of the farm for many years and we just could never break through some of the logistical issues to run a home delivery program. Finally, with the help of Cameron, we have made this potential a reality. So thanks for everyone who kept asking for this option, we do listen. After a warm February, the farm is covered under a snowy blanket awaiting some sunshine to resume its progress. I am very ready for Spring, but this moisture is very welcomed. I was speaking with some water folks at the Organic Farming Conference last week and the situation is not looking very good for this year’s irrigation. So any and all the water we can get in the valley and up in the mountains right now will help all the farmers this growing season. So let’s enjoy this and know that it will bring better local food to the scene this summer. Lastly this week, the farm is turning another year older. Stick another candle in our Organic German Chocolate Cake. 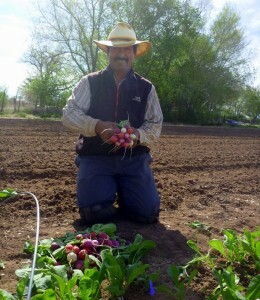 The first week of March 2003 we broke ground at the Los Poblanos Ranch and began the journey of expanding the availability of CSAs to New Mexico. 12 years later, we are stronger than ever and I cannot thank you enough for all the support you have given the farm (and me) over the years. We truly could not have done it without you all. And it is with that honest sense of impermanence that I have to face every new day here at the farm. Sure people will always need to eat, but they do not need to eat our food. There is plenty of food out there to be munched on and we have to remember that daily. Just because we grow food in your backyard does not make us special. That does not give us staying power. We have to do more. And being more to you has come in many forms—night deliveries, expanded delivery days, customization of your Harvest Box, adding more staple products, highlighting seasonal specialties. On the surface you look at any one of those and not see anything super special. But it is the larger perspective that we try and take with our members. At the root of it, we are not trying to “sell” you something. I want the farm to nudge our way into your lives where food and the farm become a part of your lifestyle. A place where you look in the mirror and say, “Dang, I am what I eat and it feels good.” This has been our goal from the beginning and I am happy to say that after 12 years of being your neighborhood farm, our goal has not changed. As a small token of our appreciation for all of your support of the farm, we are going to reopen the “Prepay Discount” to our members. For the month of March, if you prepay $1,000 to your account, we will give you an additional $100 to spend however you choose. Sure you are not going to retire early with the $100, but it will help cut your food budget by 10%. There is no expiration date on that money as well. Use it whenever you feel like it. That is about all I have for this week. Stay warm and safe and spend some time playing with your food in the kitchen. It was hard for me to read this article. I believe (and want to believe) that the small farm can be a good business in addition to enjoying the many “benefits” like seeing a seed emerge from the soil or watching a pig root around. So this article questioning small farms’ staying power really hit the core of what I believe. As I was reading this though, something jumped out at me—businesses fail all the time. Less than half of all start-up businesses are still operating after 3 years. Just because someone is a good chef does not mean they can manage a restaurant. Just because someone is good with a hammer does not mean they can run a construction company. So should farms be any different than what the rest of the economy has to deal with on a daily basis? I don’t think so. And I think that we are just beginning to see the tip of this next phase of the small farm movement. This next stage is seeing how we can take our farms from idealism to realism? How can we take the passion of a 20 year old and transform that into a solid business for the 50 year old who wants to buy health insurance and take a vacation with their family? In essence, it is time for the small farm movement to grow up and grow through our adolescence and into adults (so to speak). In order to make this transition successfully, farmers (including myself) need to move past this notion that just because we are farmers we are entitled to something. I see it all the time when folks get together to solve the food industry. There is an underlying (or sometimes very vocal) feeling that growers need free land, access to free equipment, should pay less taxes, and on and on. In order to become better, we as farmers and as consumers have to shed this feeling of entitlement. I have met a lot of folks who own their own business and I have never heard one person say, “I am so glad I chose the industry I did, because it is so easy.” That just does not happen. Norm Peterson said it best in Cheers “It’s a dog eat dog world out there and I’m wearing Milk-Bone underwear.” Our farms can, and have to, compete in the open market in order for us to truly call what we are doing sustainable agriculture. With all of that said, there was a part of the article that I think she nailed. And that was when she mentioned people who said that they loved having a farm in their community (“It looks so beautiful”) but then would not support the farm through buying their food. Unfortunately, I have heard this firsthand and seen it play out in towns where I have farmed. Small farms exist for one reason—because the community wants them there. Every town (for the most part) has access to food outside the local farms. So it would be untrue to say that towns need farms. Towns want farms. This is a huge distinction that needs to be made. Therefore, the support from communities is what keeps farms going and growing. Farmers and consumers need to realize this. We are here because you want us here and support us being here. Lastly, this article was timely because of a new direction we are heading to extend our internships. After 8 months on a farm, you have barely gotten your feet wet. So we are hoping to expand our internship program from 8 months to a longer journey (3 yrs) from intern to farm owner for qualified and driven young farmers. I need more space to layout this new model, but basically we want to create a process that invests not only in our farm, but in our local food systems. I can honestly say that there is no school or farm who could better prepare a grower to farm in NM than we can and we need to maximize this potential for future growers and this farm. What an amazing start to February. The warm weather and clear sunny days have kicked our greenhouse production up about a week so we began a radish harvest earlier than we expected. These are some of the most beautiful radishes I have ever seen. The cool winter nights and warm days have allowed these babies to grow quickly but not be stressed out which makes them more spicy. I know some folks love that spice, but I think you will really enjoy these roots on your salads or shredded on sandwiches. We also began our hydroponic harvest this week to offer bok choy and head lettuces. We do not have enough of them to put in everyone’s Harvest Boxes (yet) but they are available as substitutions. Try these dudes out and please let me know any feedback you might have. Personally I think the flavors and quality are as good (maybe better) as any time that we harvest from the fields. And as I have written about recently, this hydro system opens up some really strong options for year-round production. We hope to expand this system after a couple more months of trialing. So your feedback is invaluable. I also would like to get you up to speed on a new beef rancher we have added to our team. Let me preface this next phase quickly here though. I do not see myself or this farm as an avenue to tell you what you should be eating. I have my philosophy that I live my life by, as do you. I do not like being told what I should eat, who I should vote for, or what religion I should or should not follow. And I think that I speak for most people when I say that. I am an educated conscientious adult so I feel quite capable of making good(enough) choices throughout my life. With that said, the farm is about one thing, offering you options that I do not think really exist in our marketplace. This is not a zealot training camp. We put out options for you to choose from and then your choices let us know if the products are worth keeping around or not. In its most basic sense, this is the democracy of our marketplace. You choose (vote) what you support. Plain and simple. No one forces you how to spend your money. It is up to you. So how does the farm fit in to this free marketplace? 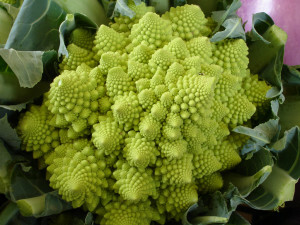 Well, initially we started out as wanting to offer better choices in your vegetable and fruit selections. And we have done that. Very well I think. But as that grew, member demand quickly spread to bread, milk, eggs, pork, chicken, and beef–the demand for foods outside of the produce world, but raised with the same philosophy was huge. It was about this time that I realized that we could not be all things to all people. We needed help. My mentor, Farmer Erick (yes we have the same first name) used to say that “Purity of heart was to will one thing.” And his words rang in my ears. We could not be the rancher, baker, dairy, and produce farm. We had to know when to say when. 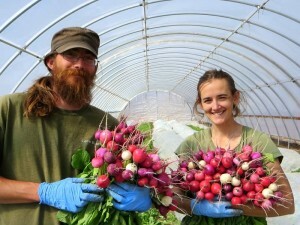 By bringing in partners to our CSA, I feel that it has become more diverse and more fun. We have seen these symbiotic additions with fruit, baked goods, milk, and now I think we will see it with our beef offerings. We received a phone call from the Perez family around Christmas. The family has been ranching in New Mexico for 3 generations and are currently raising 40 Black Angus prime steer in Los Ranchos. After meeting the Perez family and seeing the quality of the animals they are raising, bringing them on-board the CSA was an obvious addition. So within the week you will see an expanded beef offering from the farm. These will be sourced from the Perez family’s prime Black Angus animals, processed locally, dry aged over a month, and brought to you by our vans. We have been looking to expand our beef selections, but we needed to do it in the right way. To me, this feels like the right way. And I know you will be impressed. As a part of this new direction in beef, we are trying to use more of the animal because we are buying the entire animal. So look forward to seeing everything from stock bones to premium steaks. We hope to build this into a full line of locally-raised high quality meats unlike anything that current exists in New Mexico.